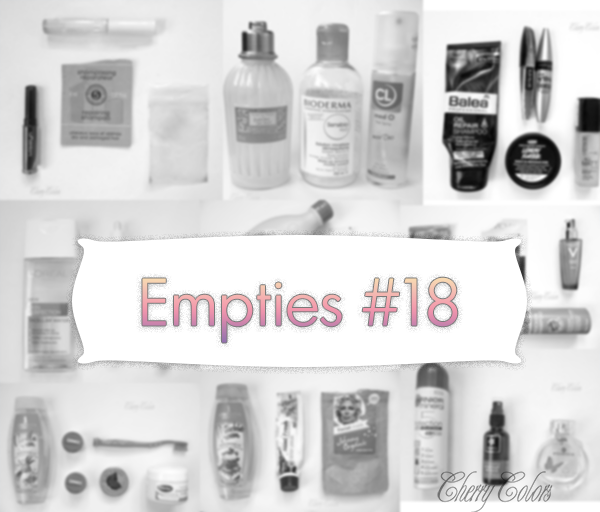 Empties #18 - Cherry Colors - Cosmetics Heaven! I procrastinated my empties post for so long, that this one is going to be massive! 9 pictures with each at least 3 products on it. So I'll be quickly reviewing (talking about) 36 products. Curious? Then read along ;). Afrodita Pistachio Cream Shower Gel (2€): I bought it just because I had a coupon for 50% off and I needed a new shower gel. Also because of the beautiful design of the bottles. I did like showering with it and the scent is lovely. Creamy shower gel with some little parts in (like parts of hazelnut shells?). Would repurchase. Himalaya Mint Fresh Toothpaste (~4€): A toothpaste that I liked using. It is actually more of a green gel than a paste. It leaves a nice and minty fresh taste and feeling in the mouth. Nothing too special or extraordinary. I remember it burned a lot! Not sure about repurchasing this one. 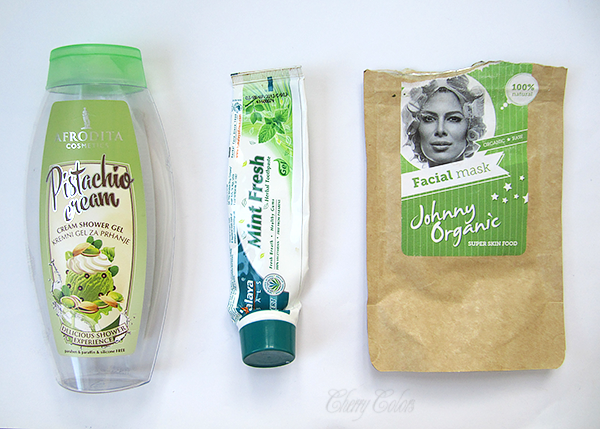 Johnny Organic Detox Facial Mask (14€): I got this one for review purposes. I liked it quite a lot and liked using it weekly. My kid got scared every time I put it on and ran away from me. No kisses from green mommy! My skin likes it and I was sad when it was gone. I wasn't exactly planning on repurchasing it (simply because I have other masks to use up first), but the lovely Jasna gave me hers. Thank you!! Afrodita Vanilla Cream Shower Gel (2€): Yes, I got two! This was the second scent that I loved from their line (the other two just aren't for me). I am happy with this one too. I love how smooth my skin felt after using it. Luckily it didn't dry my skin out. Win! Would repurchase. 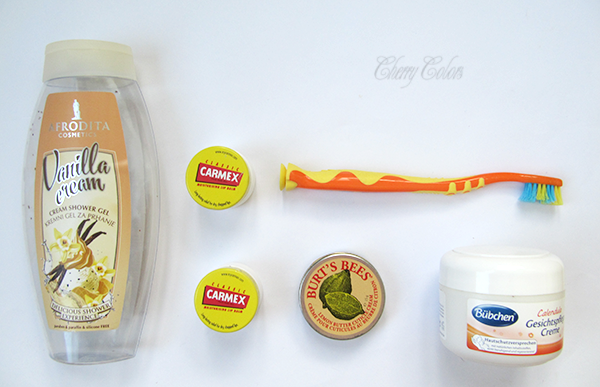 Carmex Lip Balm in a pot (2€): As you can see, I have several used up. I love it very much. It's mine to go lip balm and I keep it next to my pillow. Why? Because I use it at night. It helps with extremely chapped lips and I love the slight minty feeling I get when I use it. Will repurchase! Burt's Bees Cuticle Cream (~8€? ): I reviewed this product here, and it's been a very very long time since. I'm still not a huge fan of it and in the meantime it got bad. Started stinking and now it has to go. I just don't like using it, because I prefer using heavier stuff on my cuticles. I prefer the Lush Lemony Flutter. Won't repurchase. Buchben Calendula face cream for Kids (4€): I was really hoping that my kid would love using it, but as he grows bigger, he loathes every single cream. I will try next with my regular old' Nivea for his face (because he gets dry patches because of the cold wind and so on). Well, the kid didn't like it and I didn't use it because it feels weird. The cream is this cream + watery party and when you apply it, it feels like you are applying a cream dipped in water that just didn't mix well. It's really weird and I can't get used to the feeling. But it is nicely hydrating and smells like calendula. I probably will repurchase it in the hope that the kid will use it. Jordan kids toothbrush (~4€): Would you guess that this toothbrush that is so damaged was in use just for a single month?! Yes, my kid is the toothbrush destroyer and we have to switch his toothbrushes every single month. I did like the design but didn't like the bristles, so I probably won't repurchase. Garnier Protection 48H + Spray on Deodorant (~3€): What to say, I used it in combination with other regular roll-on deodorants, which didn't last long enough. It's fine. Nothing special. I'm not sure if I will repurchase it. Eteris Roses Hydrolate (? ): I got this as a gift from a lovely friend and at the time I had dozens of opened tonics, so I had to use those first. But I did use it once or twice and then forgot about it. Sadly it spoiled and now I have to throw it away. :( Won't repurchase. Essence like a First day of Spring perfume (~7€): I don't use lots of perfumes, but here and there I like to smell extra nice. Well, I had many perfumes "lying" around and I feel it's such a waste if stuff doesn't get used. So I used it as a bathroom refresher. And you know what? It did well! No yucky undertones in the bathroom when I sprayed with this perfume around the room. Win! Would repurchase! Balea Silver Shampoo (~4€): I bought this shampoo in hopes it would help with my yellow hair, this was almost a year ago. It took me a damn long time to use it up, simply because I hated it. It made my hair dry and lifeless and it did nothing for yellow undertones. Won't repurchase it, hell no! 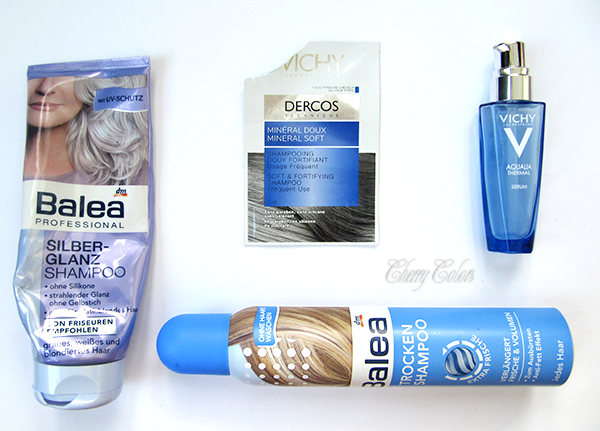 Vichy Dercos Mineral Soft Shampoo (sample): I was curious about this shampoo because I didn't even know that Vichy had hair stuff. Well, I found it to be no good and nothing special. I am glad I didn't get a full size and that this sample was available. Won't buy! Vichy Aqualia Serum (28€): I got this one as part of a prize back in January. I managed to use it only during the past Summer and I must say that I love it. I am not a huge fan of the silicones in it, but I love the effect it has on my skin. I would totally repurchase it! Balea Dry Shampoo (2€): I bought this dry shampoo a long, long time ago. It was my first dry shampoo and because of it, I didn't know what to expect from it. Well.. When I use it, there's the very powerful scent coming out of the can, so you can't breathe for a couple of minutes in that room. It leaves a white residue in your hair and the hair gets oily again in a matter of a day. So, it's a cheap dry shampoo but I am sure there are better out there. A big plus is that it lasts a long time! Won't repurchase. Babylove Bath Foam (~3€): I keep repurchasing this one because it comes in this huge packaging, isn't all that expensive and it has a nice scent. 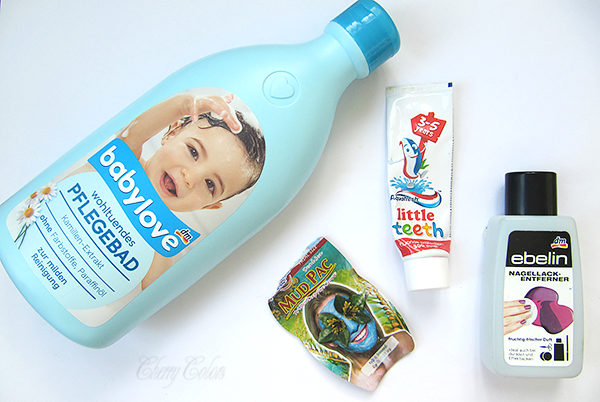 It makes amazing bubbles and doesn't irritate kid's skin on eyes. Sadly my kid has started hating bubbles in his bath (must be a phase?! Yes? Please..), so I am not sure when I will repurchase it. Aquafresh Little Teeth Toothpaste (~4€): I bought this one because I liked the packaging and well, the kid picked it. I prefer toothpaste without fluoride but he wanted it, so we gave it a go. I am not sure about repurchasing it, simply because there are many other brands with similar products. Not sure about repurchasing. Ebelin nail polish remover (~1€): I get through these things quite quickly and Ebelin has been a brand that has had great nail polish removers. This one is just like that, did the job well and didn't dry out my cuticles. Did repurchase! Montagne Jeunesse Mud Pack mask (1,55€): I got this mask in the package from Licila.si (from the 1st Beauty Conference). I did get it with two others, but I totally forgot to take pictures. I liked this mask, it left my skin smooth. But on the other hand, the Roses mask irritated my skin and it burned! Also, their Cucumber peel off mask was super fun. 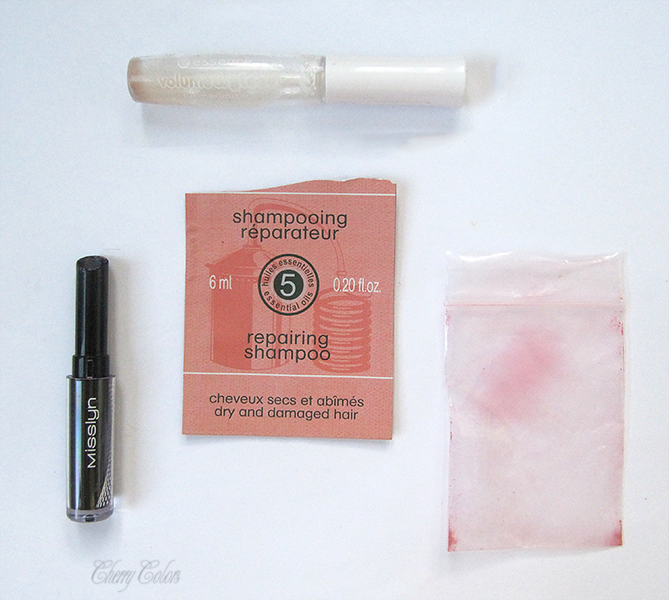 So I guess they are a hit or a miss, but I will definitely repurchase them! 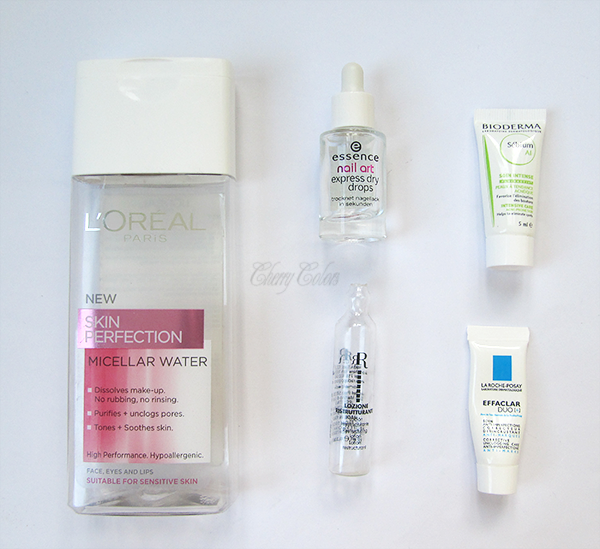 L'Oreal Skin Perfection Micellar Water (~5€): This is one of the cheapest Micellar waters on the market. I loved everything about it (no scent, non-irritant, cheap), except the pesky dangerous ingredients that will be banned in the future - polyaminopropyl biguanide. I won't repurchase it until they take out the ingredient. 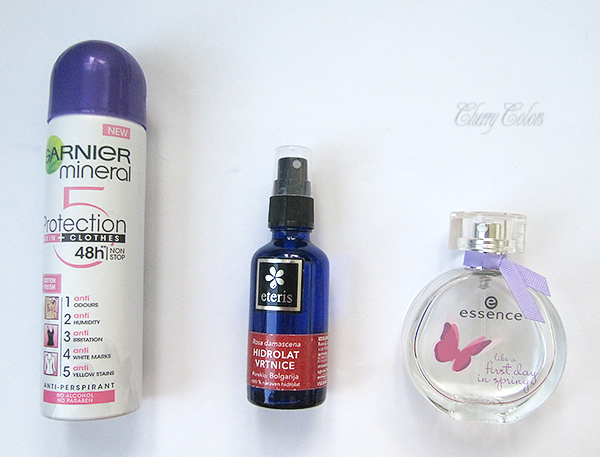 Essence Nail Art Express Dry Drops (~3€): A manicure and time saviour. It's a must. Everywhere and anywhere. I think it's the cheapest version of these quick drying drops on the market. Will repurchase! Bioderma Sebium Ai (sample): I got this sample from the dermatologist and she told me to apply it only on pimples. It contains glycolic acid and it actually does a great job at combating acne. I am not sure about purchasing the full size, but if I can get my hands on another sample, I will be happy with that. RR Creatine Hair Mask (12€/pack of 10): I got this hair vial from my sister. She bought the whole pack from a store that sells to hair salons and also people, in general, but it's a specialized store. This is the product that got my hair to almost normal texture after it got fried from over bleaching (with weak peroxide). Will repurchase once I run out. La Roche Posay Effeclar Duo + (sample): This is practically the same thing as Bioderma Sebium Ai. Just a tad smaller sample. If I am not mistaken, it's more expensive? 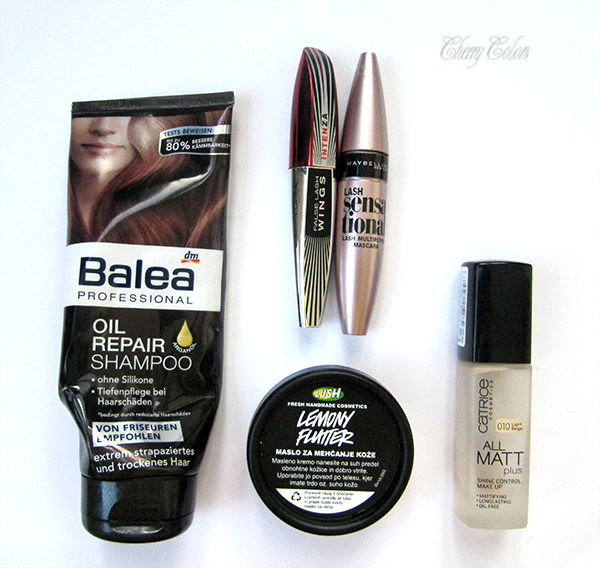 Balea Oil Repair Shampoo (2€): This was my to go shampoo before I got the Aussie pack. It is a nice shampoo that doesn't dry it my hair and does nourish it a bit. Ant for a fraction of the price. I may repurchase it. L'Oreal Intenza False Lashes Wings Mascara (~13€): I got this mascara in a giveaway (hosted by the lovely Simona) and well, I was disappointed. Because the mascara was too wet and I wasn't a fan until the very end. At the end, it got dry enough to give me volume. But sadly I find it to be too expensive for such a disappointing product. Won't repurchase. Maybelline Lash Sensational Mascara (10€): The best mascara ever! Seriously! I completely forgot why I stopped using this brand of mascaras, but now that I remembered how great they are, I'll be back for more. Will repurchase! Catrice All Matt Foundation (7€): This was my staple foundation for about 2 years. I used up one bottle each year and it really is great. The price is fine especially considering it lasts a year. It's not suitable for dry skin as it adheres to flakes, but for mixed or oily it's just perfect. This year I got myself the Skin Tone foundation by Catrice, so I am not sure about repurchasing it since I find the new one to be even better! Lush Lemony Flutter Cuticle Cream (10€): This cuticle cream was once priced at 7€. The price went out about two years ago, I think? But anyway, a pot lasts a very long time and it's a cuticle saviour. Will repurchase it. Like forever. L'Occitane Jardin Secret Body Milk (23,40€): This product was part of their limited edition and I did a review about it here. I love, love, love it. Seriously. It's the reason why I started using body lotions. And it's really great that I did so. My skin has never been smoother and happier. Sadly now that I used it up I have to use up other products too. This one is discontinued. 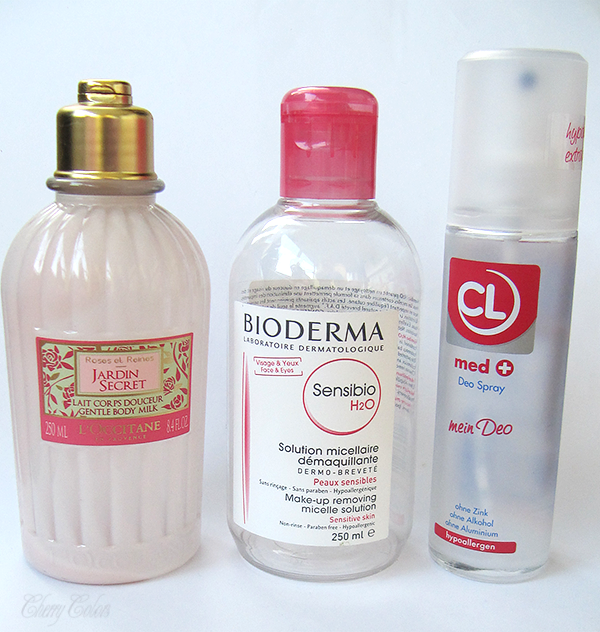 Bioderma Micellar Water (12€): A product that I will keep repurchasing. It's just THAT good. I did a review about it, here. CL Med + Spray Deodorant (? ): I can't remember the price, but it was probably somewhere between 3 and 6€. I had high hopes for it, but it didn't deliver. The scent is nice and clean, but I started stinking after two hours. However, it did wonderfully in combination with spray-on deodorants. I didn't get any irritated skin because of it, which is a plus. I am not sure about repurchasing. Essence Volumizing Lip gloss (~2€): I got it from Ajda, thank you dear! I used it religiously and loved it a lot. I love the minty feeling it gave my lips! But the packaging is bad and it broke during use, booo. I probably would repurchase it, but it's discontinued. L'Occitane Repairing Shampoo (sample): I didn't know they had a line of shampoos, but I shouldn't have been surprised. But I was surprised at how good this shampoo is! Made my hair super soft and silky and happy! They also took longer to get oily. The price is very steep, about 24€ for 500ml, but the refills are way cheaper. I may purchase it, but I will have to think about it. But it's REALLY good. Sleek Makeup Rose Gold Blush (sample): I got this sample from Ajda, and I couldn't have been happier with it. I used the sample in a week because I couldn't stop using it. I tried purchasing it since then, but their site won't let me and now it's sold out on Licila.si. Ahh! I need it in my life! Misslyn lipstick with glitter (? ): Another gift and I must say that this lipstick was fine. Very wearable because the glitter wasn't all that noticeable. But it did feel gritty on my lips. I was at the end of the lipstick (had like 1cm of it), when my kid decided it would make a great snack (?!). So now it's gone and I won't be repurchasing it. And now, this is FINALLY the end of this extremely long post. Hope you found some interesting products.